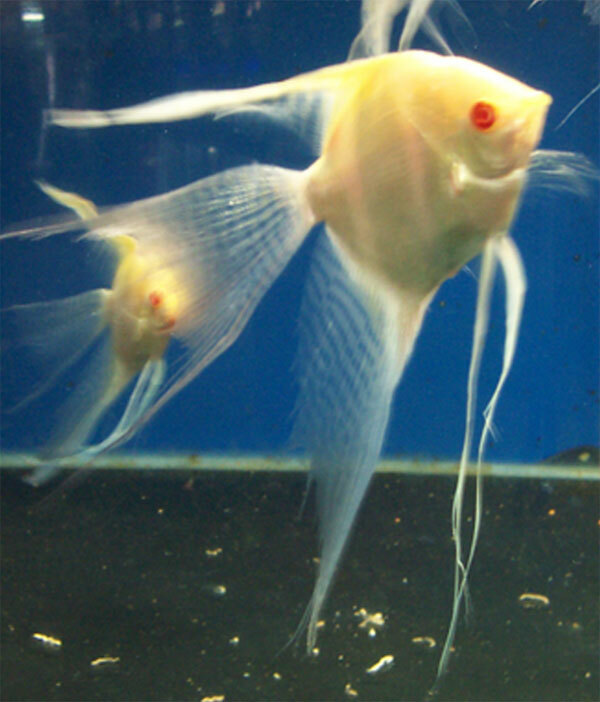 The Albino Angel is a strain of angelfish that is white to silver in color with yellow/orange coloration across the head and has pink eyes. The Albino Angel needs to be fed a variety of foods including vegetables as well as meaty foods. Feed a quality flake food as well as live and frozen foods such as brine shrimp and bloodworms. 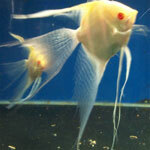 It is best, when trying to breed the Albino Angel, to house a number of angels in the same aquarium until they pair off. After a pair has developed, a flat surface needs to be provided where the eggs can be laid. A piece of slate, a large plant leaf, or even a flowerpot should be positioned at an angle of about 30 degrees in an area of moderate water flow. The female will lay the eggs and the male will follow behind to fertilize. After approximately three days, the eggs will hatch and the fry will emerge. Feed the fry newly hatched brine shrimp until large enough to accept crushed flake food. Compatible with some South American Cichlids such as the German Blue Ram or any of the Apistogramma species. Do not keep with small tetras or other small fish 3.8cm and under, they may well become lunch, or overly aggressive fish. 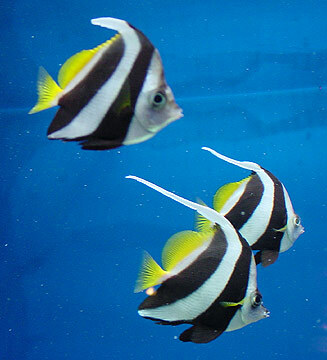 Avoid known fin nippers such as Tiger Barbs or Serpae Tetras. Other territorial mid-top dwellers such as Betta splendens and Gouramis are not advisable either as they may become too curious towards the Angels. 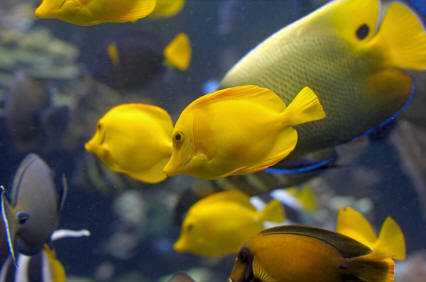 As a group freshwater Angelfish are territorial and will squabble with one another until a dominant male is established. They can be kept singularly, in mated pairs or in medium sized groups of 6 or more.